Association centre for susutainable Comunnity Development Debar with YES Alumni association at 23 .02.2017 held a Social Entrepreneurship Workshop in Debar, which was organized by American Councils and STARTUP Development Association and funded by the U.S. Embassy and YES Grants. Similar workshops were organized for high school students in four small cities in Macedonia: Bogdanci, Probishtip, Debar and Makedonski Brod. The cities are chosen in order to reach out to communities which unlike the bigger cities, are not exposed to the concept of social entrepreneurship as often. While the meals and supply costs regarding the workshops will be covered from the grant obtained by the alumni, in kind donations from the selected communities are very welcomed and greatly appreciated. “Tomorrow’s entrepreneurs” is a project aiming to introduce the concept of social entrepreneurship to Macedonia’s youth, as a tool to solve various current problems, especially in our smaller local communities. The participants of the workshop would 20 students in their third and fourth year of high school education. Economics and business are annually one of the topics that interest high school students the most. This faculty of Economics has more than a 1000 students every year, and having to many graduated professionals in this field makes it very competitive to find a job. Because of this many students are barely motivated and even turn to other professional fields. By introducing the concept of social entrepreneurship we offer them an alternative way of doing what they like, improving their community and making a decent living, an option in which their creativity, hard work and skills are more important than their diploma. The workshops will be divided into four sessions. The first two sessions will revolve around explaining what social entrepreneurship is and what the process of developing a startup involves. This will be done in group discussions using examples of social enterprises in Macedonia. 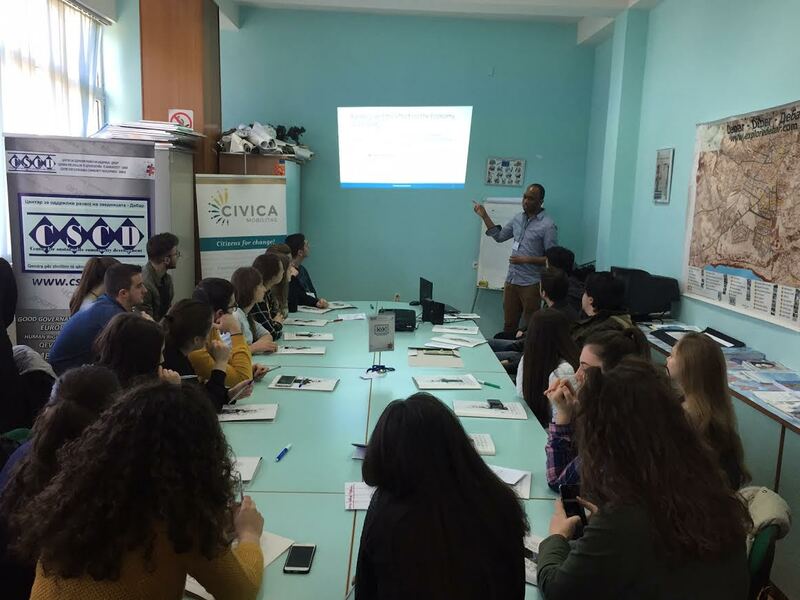 The second part of the trainings will contain more hands on activities in order to encourage them and to show that all of them as active participants in their community will have great ideas on how to solve local issues. Through a brainstorming process we would aid them in recognizing the problems in their local communities, going through the process of coming up with and idea and evaluating its main strengths and weaknesses. Finally the students will have to present their solutions in front of the group. To prepare for this the students will be able to use crafting materials to create posters and projector to play any kind of video, any other innovative approach will be also welcomed. Participants will be divided in small groups and have an assigned facilitator in order to get mentorship and help with their presentation. After the presentations participants will get to vote on the best idea of them all. From the first voted of all four of the workshops the organizers will chose the first prize winner, where the remaining three will be awarded follow up prizes. At the closing ceremony all the participants will be awarded with certificates. Certificates will also be provided to all partnering organizations (schools, NGOs, municipalities, Culture Centers etc.). Goal: To educate youth from small cities to take an entrepreneurial approach to addressing social issues and community needs. How? Through one day trainings organized by YES alumni and Peace Corps volunteers. Students will be applying through an online application form. Questions will be related to their previous experience with civic activities in their community, experience with team work, interested in addressing local issues and motivation to participate in the workshops. Participation will be free of charge. The selection will be made by the organization team of YES alumni. Supplies for coffee breaks, water etc. *preferred venues are cultural or any kind of civic centers, spaces of NGOs that might cooperate on the project. Being that these might be hard to find we would be all right in working in a restaurant or hotel that might rent us the space and also prepare lunch. Being that we are trying to book the workshops on weekdays schools might not be the best option. Presenting the workshops to high school students in their cities, either through communication with teachers or presenting it themselves.